The symposium released findings that debunk the black legends of the Inquisition, such as the notion that Catholics burned heretics indiscriminately by the hundreds. Let me note that this particular apology of John Paul II coincided with the release of the Symposium Report, a large 783-page volume assessing the Inquisition based on up-to-now inaccessible documents from the Vatican archives. The findings of the team of researchers far from justify a papal apology. The opposite is true. They affirm the conclusions of recent academic studies that show the torture chambers, witch-burning, and vindictive power-crazed churchmen were nonexistent, part of the “black legend” invented by the Protestants, emphasized by partisans of the French Revolution, and broadly spread throughout Europe and the United States up to our times [see my tape The Myth of the Holy Inquisition]. What did exist were various particular Inquisitions launched by Popes to deal calmly and fairly with specific problems at different times and places. 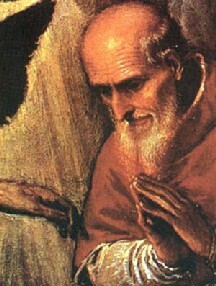 Pope Gregory IX (1227-1241)established the institution and St. Dominic's order, founded to defend and maintain the orthodoxy of the Faith, were asked to run the courts of the Inquisition. 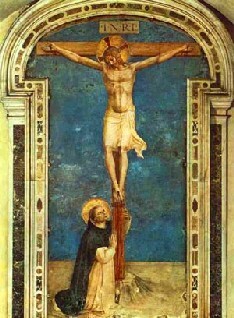 The inquisitors, delegates of the Apostolic See, were charged with the task of combating the Albigensian heresy in southern France in the 13th century. The most famous and much maligned Spanish Inquisition was established in 1478 by Pope Sixtus IV in response to numerous complaints Rome was receiving from southern Spain about the many heresies and immoralities introduced into Catholic doctrine by false believers and converts. I refer you to a booklet written by three priests of Miles Iesu [Soldier of Christ society] entitled Why Apologize for the Spanish Inquisition? 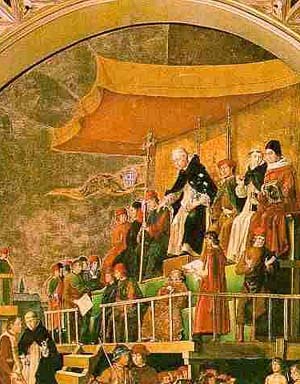 The priests present findings of modern scholars on the topic and correctly conclude that the world is indebted to the Catholic Church for establishing the tribunal of the Spanish Inquisition, because “its legality, fairness and clemency due to Catholic thinking based on the consistent moral teaching of the Catholic Church saved millions of souls from confusion, contradiction, hatred, poverty and death” (Chicago: Miles Iesu, 2000, p. 27). At the June 15 press conference in Rome, Agostino Borromeo, symposium spokesman, pointed out how the Spanish Inquisition held far fewer trials than had been supposed and employed a direct and open policy throughout the trial procedure. The accused condemned to death comprised only 1.8%, and this includes the 1.7% condemned in “contumacy,” that is, burned or hanged in effigy since their whereabouts were unknown. Which means that only .1% of those tried by the Spanish Inquisition were actually burned or hanged (Zenit, June 5, 2004). About the notorious “witch hunts,” Borromeo again confirmed what scholars have been demonstrating for the last couple of decades. 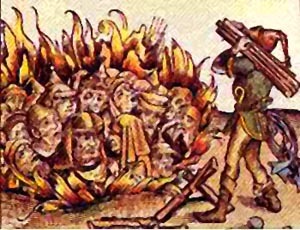 Most of the witch burnings of modern Europe (and there was almost none in the medieval period) occurred under Protestant tribunals, not under the Inquisition in Catholic countries. Quite the opposite, it was the Catholic Inquisition in Spain that often intervened to defend the women accused of being witches, just as it protected Jews from mob lynching frenzies. Here are some of the symposium’s figures: witches burned in Switzerland under Protestant tribunals: 4,000; in Spain under the Catholic Inquisition during the same period: 39 (ibid.). The Roman Inquisition was begun in 1542 with the same noble aim of preserving the Faith and eradicating heresy. Early in its noble and glorious history, the future Pope Pius V, zealous in the fight against heresy, was selected as inquisitor in Milan and Lombardy, and in 1557 Paul II made him inquisitor general for all Christendom. A modern scholar, John Tedeschi, concluded that the Roman Inquisition did, in fact, dispense judicial justice, and was even “a pioneer in judicial reform in modern Europe.”(1) This same institution became the Vatican Holy Office and later, in 1965, Paul VI changed its name, to The Congregation for the Doctrine of the Faith. Drumhead courts, torture chambers, or judicial labyrinths with no escape impossible simply never existed; there was no such “Inquisition.” Therefore, general condemnations and consequent apologies for an abstract “Inquisition” are wrong in principle, since they do not consider the particular reality of these different institutions. To condemn “The Inquisition” would be as wrong as condemning “The University” in general, without identifying any particular one or ones. Such condemnations of this splendid institution appear to be just more fuel being poured on the revolutionary fire that is trying to extinguish the militancy of the Church. Why would he make this new apology? At the very moment when significant data are presented to the world destroying the black myth of the Inquisition, why would he make a plea of forgiveness for “methods of intolerance” that have “disfigured the countenance of the Church”? (“John Paul II Letter on Inquisition Symposium,” Zenit, June 15, 2004). Is it to further confuse an already muddled up matter? Certainly the attitude he took is highly confusing… Does his apology signify a split in the Vatican, with the Pope taking the side of the progressivists against the scholarly findings? At any rate, his condemnation of a laudable institution that defended the Faith placed at risk is to pass the judgment that the Church should accept all the heresies and errors of her enemies. Which, in my opinion, is equivalent to attacking Catholic militancy and promoting the destruction of the Church. Instead of an apology, think how much good it would have done us to hear a clear assertion from the Supreme Pontiff that the Inquisition was correct in its procedures and fair in its punishments. Instead of a sniveling position of self-blame for all the evils of History, the Church should proudly affirm her militant past and the sound institutions she developed to keep herself free of heresy, error and injustice. One such institution was the Inquisition. The Symposium’s report helped to affirm this. Why didn’t the Pope? 1. The Prosecution of Heresy: Collected Studies on the Inquisition in Early Modern Italy (Binghampton, NY: 1991), 7-9.